Earlier this month Google launched the web version of Android Market, which lets you purchase applications from your web browser and have them beamed directly to your phone or tablet (it’s very slick). 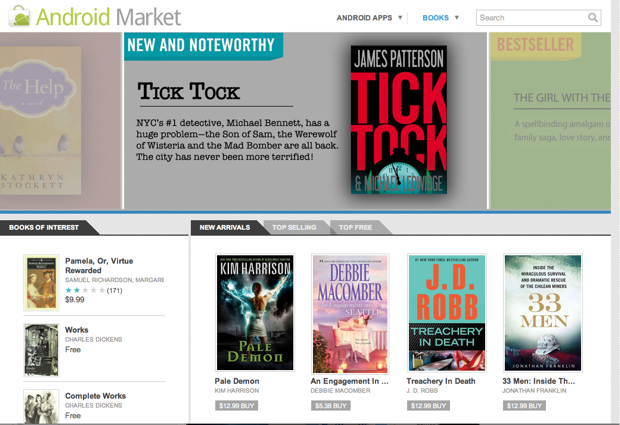 Now, Google has some good news for you bibliophiles out there: The Xoom’s Android Market application includes Google Books, and now the web version does too. You can find it right here. Buying a book on Android Market works just the same as buying an app — you click on the price (or the ‘free’ label), choose a method of payment, and your new book will show up the next time you fire up the Books application on your Android device. As far as I can tell you’ve actually been able to do the same thing from books.google.com, but this has the potential to expose the book store to the millions of people using Android, who otherwise may not have been aware it.